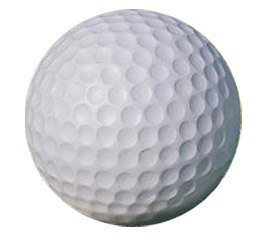 These concrete golf ball bollards show the way to your driving range or golf course. The concrete golf ball bollards also act as a barrier while limiting access to high profile areas and controlling vehicular traffic. These bollards all have 3/8" reinforced steel rebar for added strength and meets all the ASTM standards. Do not place this product on grass or any surface that will flex or move, it must be placed on a flat surface such as concrete. There are two styles of anchoring available. Anchor Style A - for decorative installation. Anchor Style B - for barricade installation.